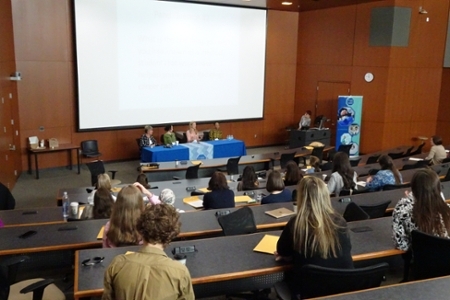 Nearly 50 medical students, residents, fellows, alumnae, and faculty helped bring “Radiology into the Light” at Emory Radiology’s first Women’s Symposium on Saturday, April 1st. The topic is important to Dr. Levey, who co-chairs the resident section of the department’s Diversity and Inclusion Taskforce with Christopher Ho, MD, director of the Diagnostic Radiology Residency program. 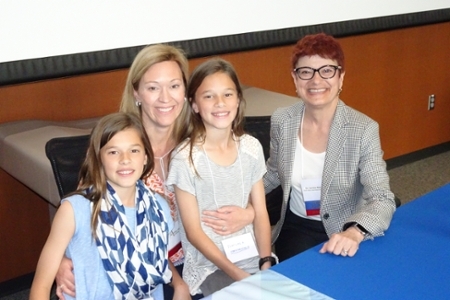 Levey devoted dozens of hours outside of her busy clinical and teaching schedule to organize the event with third-year medical students Meredith Bowen, who first conceived of the idea with Emory Radiology Chair Carolyn Meltzer, MD, and Brianna Vey. Both Bowen and Vey are members of the Emory Radiology Interest Group. Carol Dowdle, program coordinator, handled logistics. 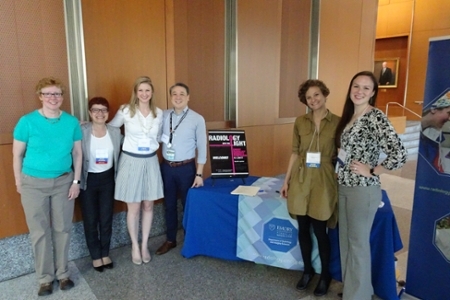 As befitting an event aimed at dispelling myths about radiology—long hours huddled over a computer monitor in a dark, cramped room in the bowels of a hospital—the participants convened in the bright and spacious School of Medicine auditorium. The diverse audience included medical students from Emory, Mercer, Morehouse, and Medical College of Georgia. A large group of Emory Radiology faculty also attended. Dr. Meltzer opened the symposium by sharing insights from her own journey to becoming chair of the Department of Radiology and Imaging Sciences. 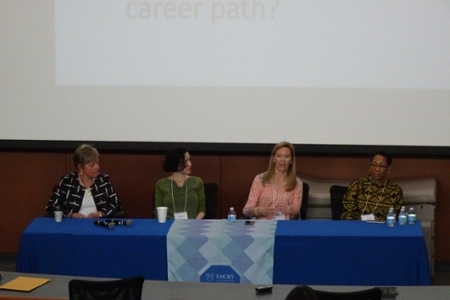 A panel of Emory Radiology faculty and alumnae discussed the joys and challenges from their own career paths. They also explained the aspects of their subspecialties most rewarding to them. From left to right below: Mimi Newell, MD, professor and director of the Breast Imaging Fellowship; alumna Alyza Golden, MD, who is in private practice; Ashley Aiken, MD, adjunct associate professor and director of the Neuroradiology Fellowship; and Janice Newsome, MD, acting associate professor in the Division of Interventional Radiology. They also discussed issues of particular interest to women, such as work-life balance, juggling the dual demands of family and career, choosing an academic or private practice path, and mentorship. “It turned out to be a wonderful opportunity for networking and learning more about what other women in Emory Radiology are doing,” Dr. Levey said. 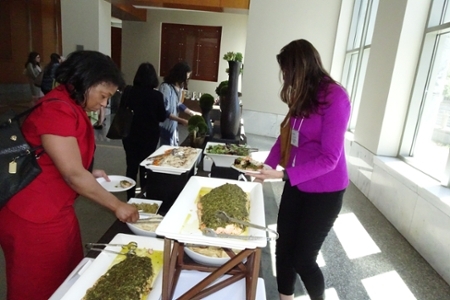 Breakout sessions during and after a delicious lunch—dispelling another myth about radiologists never seeing the light of day and never interacting with others—gave participants opportunities to learn more about subspecialties.